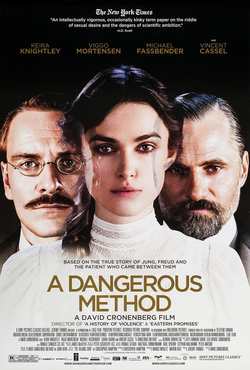 As long suffering readers of this blog may know, I am fascinated with synchronicities (aka “co-incidences”), so off I hied myself to see “A Dangerous Method“, a movie on the early professional life of the guru of synchronicity, Dr Carl Jung. I found the movie somewhat dis-satisfying, although I appreciated the exploration of his relationship with Professor Sigmund Freud, beginning with mutual admiration and the possibility of the passing on of a mantle in the fledgling field of psychotherapy, but ending in bitter acrimony. Freud’s inflexible, dogmatic and narrow theory of human problems originating in sexual repression cut no ice with the more mystical and open-minded (albeit disciplined) methods of Jung. Movies have to sell, especially when dealing with such dry and rarified topics as this), so much focus was on the vexed sexual relationship between Jung and his troubled patient (eventually intern), Sabina Spielrein. This gave scope to some nodding references to transference and counter-transference, one of Jung’s more widely accepted gifts to the helping professions. His work on individuation and archetypes found mature form later in his life’s work, and was perhaps beyond the scope of this film. The references to synchronicity were a little contrived and overdone, but having my awareness raised, I could not help but wonder at events that unfolded during the rest of my day. Having attended later in the evening the opening of the annual Stations of the Cross art exhibition at Wesley Church in the City, I took an alternative route on foot to where my car was parked, even stopping to grab a bite to eat earlier than I might have. Passing the Town Hall, I heard the familiar voice of a well known Noongar elder addressing a crowd gathered in the foyer. I stopped and went in. It was the opening of a photographic exhibition sponsored by the Wilderness Society in support of their campaign against the Woodside gas hub that conflicts with indigenous heritage and cultural interests. Some would go as far as to say that big business and economic expediency is “crucifying” again the interests of the original inhabitants of the land. Was it synchronicity that I should be arrested by a familiar voice to have my attention drawn to a topic of which I have more than a passing awareness following a contemplative experience of some artistic expression of the spiritual centre of my faith? Again, I was only drawn to the film because I had begun to read Natural Spirituality: Recovering the Wisdom Tradition of Christianity heavily based on the work of Jung.